Thanks to the double carbide counter-blade, the FP120DT is able to cut on both directions (through a double air inlet). This allows you to save time during the cross cut process. 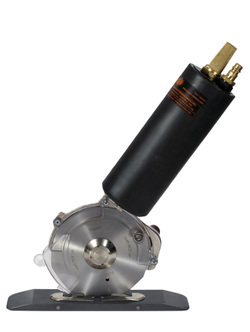 The air compressor motor is made of the latest generation mechanical and pneumatic components, so the turbine reaches a power of 645 W at 15,500 RPM and with a very high torque. FP120DT has a 120mm 8 sided knife which allows to cut any kind of material at the "flexible stage" up to a cutting capacity of 50mm. The high torque and the slow speed of the knife allow the cutting of rubber material with plastic base in the carpet and light flooring applications. FP120DT is especially suitable for the transversal cut and to be installed in small spaces and it is arranged with an anchor to a fixed position or traversing track. The aluminum Teflon® coated base reduces the friction between the foot and the material to allow the easy forward movement even for an installation sliding rails. The power and bidirectional feature make FP120DT the best solution for the most difficult O.E.M. application.